On fun surprises today, received a lovely Penhaligon’s London Hatbox filled with goodies. 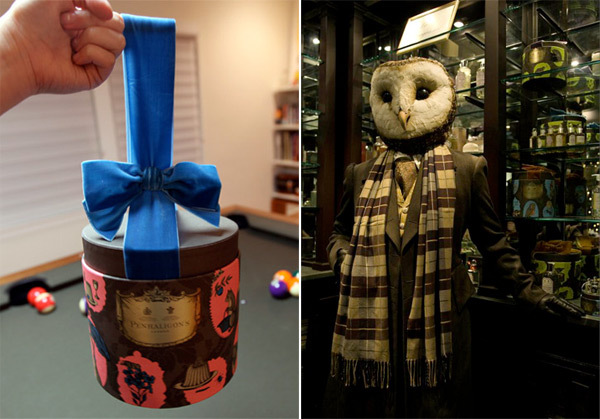 Love their holiday packaging that was covered fun woodland creature inspired designs… and to take it further, check out the Penhaligon’s Olfactory Owl they had running around London! A pretty dapper looking owl, no? Peek at the unhatboxing as well as more Owl pics on the next page! Illustrator, Eli Neugeboren facebooked me about his latest project, and it is just that perfect combination of adorably creepy and beautiful! He says on his blog, “Fashion Monster was a project conceived with photographer Dustin Cohen to combine his photographs and my “monster” illustrations. We set out to create a noir feel, knowing that the monsters would upend that with their absurd placement and bright colors. Shot on location around lower Manhattan at the beginning of Fall, the light was great and the team Dustin put together created wonderful images for me to work with.” The fashion is Edelweiss by Sarah, model is Mirielle from APM Models, hair & makeup by Angelique Velez, styling by Matthew Simonelli, ahoto assistant/stunt driver is Andrew Hanenberg, photo assistant is Winfield Foster, and producers, Kids With Candy, Casey Levine & Monique Perreault. There’s something so incredibly fun about the whole series, and will make you peer around buildings and over your shoulder as you saunter through New York… i’d love to see an animated version of this look book! See more on the next page! WOW. Sometimes emails come in, sound too good to be true, then you click a link, and your jaw just drops. 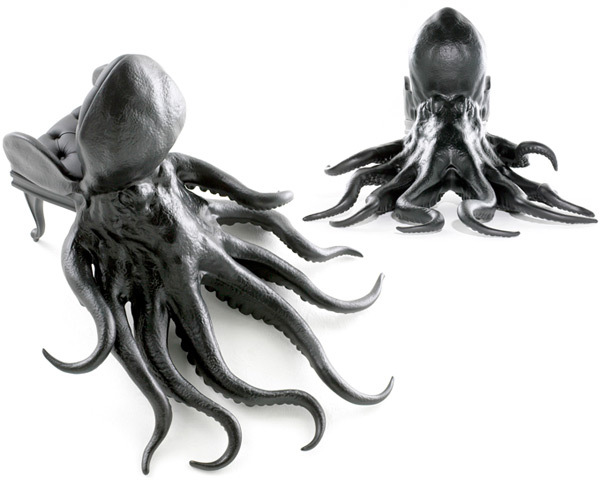 You can barely call Maximo Riera’s Octopus Chair, a chair. It’s more like an Octopus THRONE. This chair is first of a The Animal Chairs collection, consisting of more than 15 different pieces. A true art piece, it has evolved from sketches to 3D renders to CNC’d blocks which were assembled, glued, sanded, and painted by hand. A truly impressive artistic take on where the chair meets nature… one can only imagine what it must feel like to sit in such a throne! Or as Riera says “The Octopus Chair therefore becomes a powerful intersection of complex human design integrated with nature’s splendor.” Wow. You really must see more pictures of it (and the making of) on the next page. I have no idea what type of data i’d have that would need to be kept this securely. Or if i did, i probably shouldn’t tell you! But somehow, everyone’s inner bond must secretly have something worth protecting, or just love the look of a hard drive that just screams “top secret information”… When i saw the Rocstor booth, there was a gravitational packaging/soft touch/designy hard drive pull i instantly succumbed to. Then i saw keypads and pass keys and usb keys, and i was hooked. And the RocSecure line is filled with encrypted portable hard drives! My favorite is definitely the new RocSafe MX, with real time hardware encryption, and the need to authenticate via a pin number (and a card!) on the hard drive itself before the computer can even see it. Others look sleek and have usb key tokens that are required to boot the drives… Regardless of whether you are hiding secrets, or just your family photos and music, doesn’t it just seem more fun? Take a peek on the next page at the booth, packaging, gorgeous hardrives, and more details on these super secure devices! 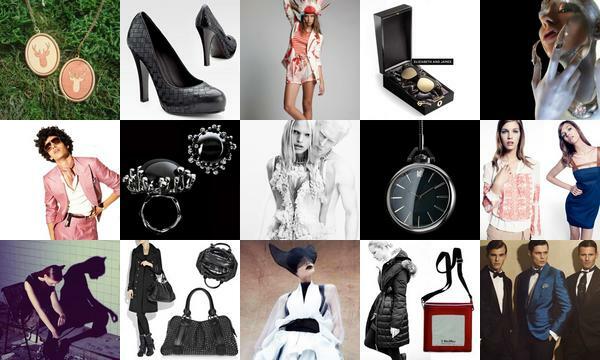 Get your fashion fix with a peek at what’s been happening at NotCouture. To find out more about each post, click on its inidividual image. 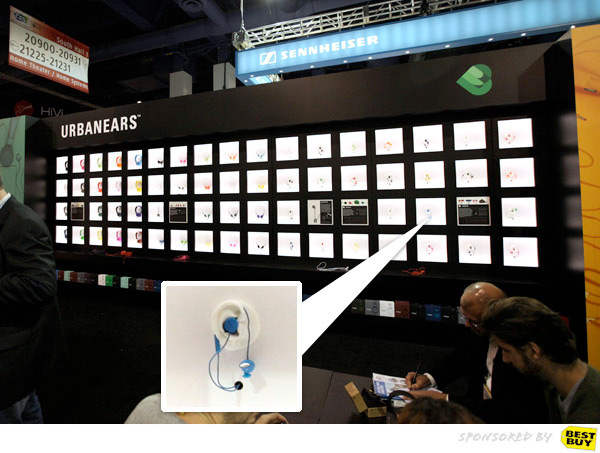 We first looked at Urbanears a while back when their stunning color themed ads started circulating… then, their CES booth was hard to resist. 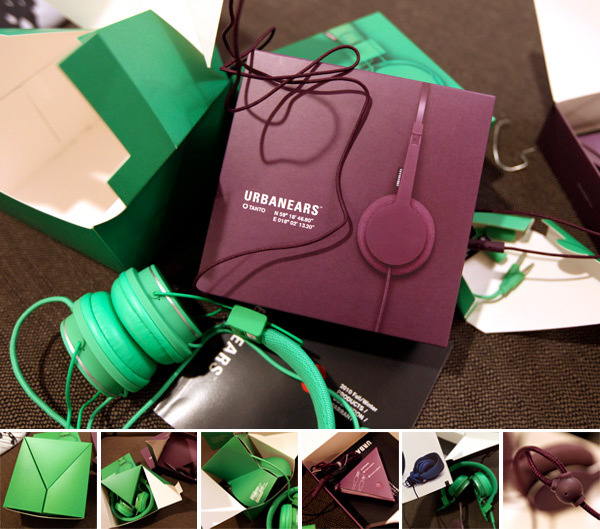 Well now, in the same beautifully colorful, minimalist design… i couldn’t resist showing you the origami like unboxing experience and product details. So much attention to detail, and clean playful designs! It literally unfolds and presents itself to you. 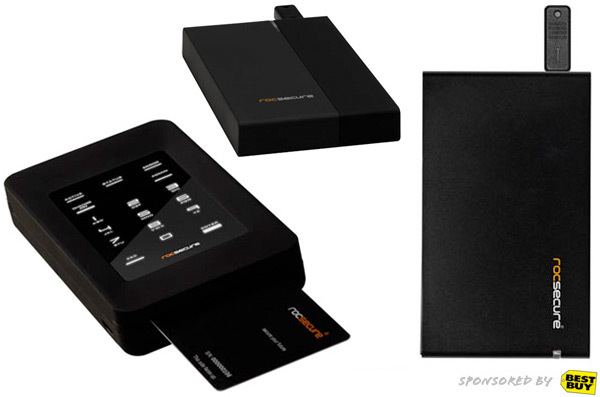 Love the matte boxes, and the soft touch details… the extra connectors… and the built in microphones mean you never need to miss a call! Take a peek at the unboxing of their Tanto and Plattan models on the next page! 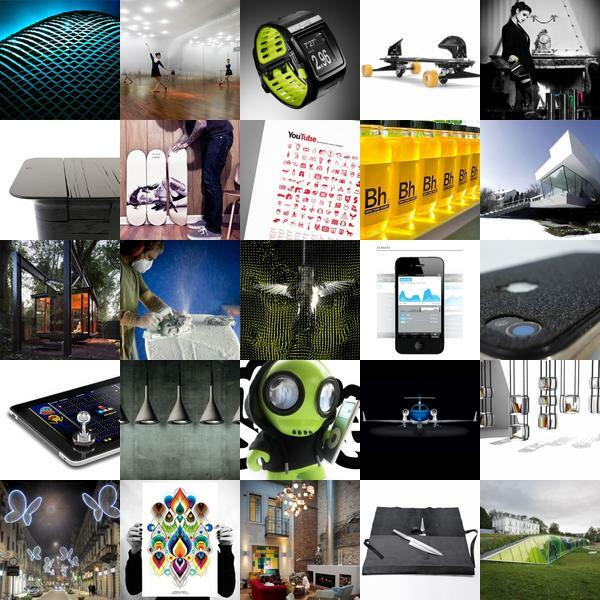 A beautiful selection of the week’s posts on NOTCOT.org, showcasing stunning architecture, illustration, gadgets and more. To find out more about each post, click on its individual image. 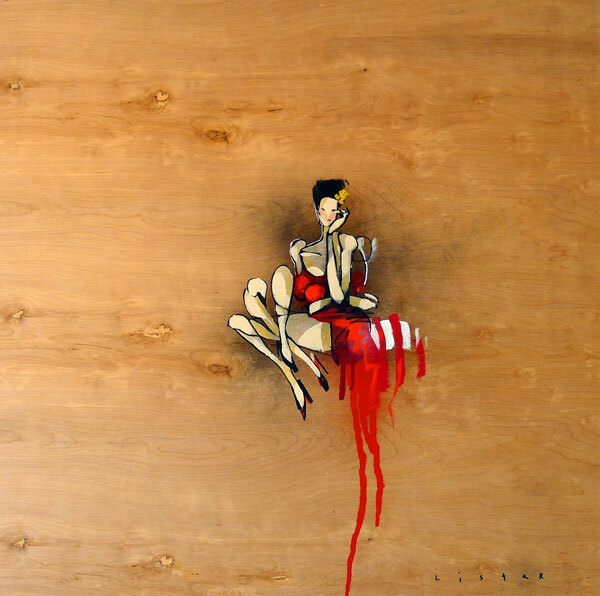 I love paintings on wood… these pieces from Anthony Lister’s solo exhibition FIERCE are lovely! From the press release: “Opening Friday, January 14, THIS los angeles and Monster Children magazine host Fierce, a solo exhibition featuring original works by Australian graffiti and street artist Anthony Lister. 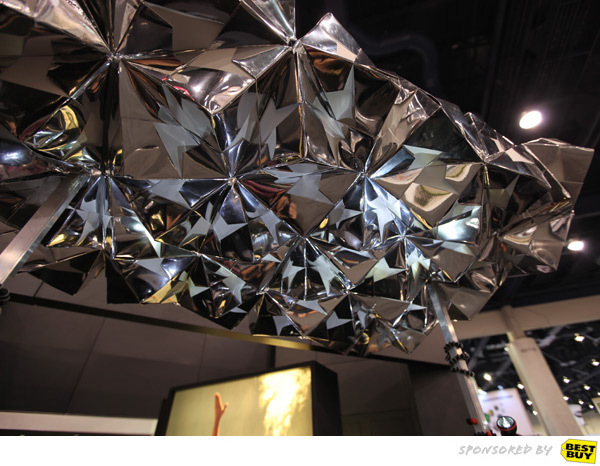 Fierce debuted this past December during Art Basel at a pop-up gallery space in Miami’s Wynwood Arts District. The exhibition will make a special one-night appearance in Los Angeles at THIS los angeles in Highland Park, and works on view include 11 wood panels, five large canvases and more than two-dozen masks.” The opening reception takes place on January 14, 7-10 p.m. at THIS los angeles, 5906 N. Figueroa St., Los Angeles, CA 90042. 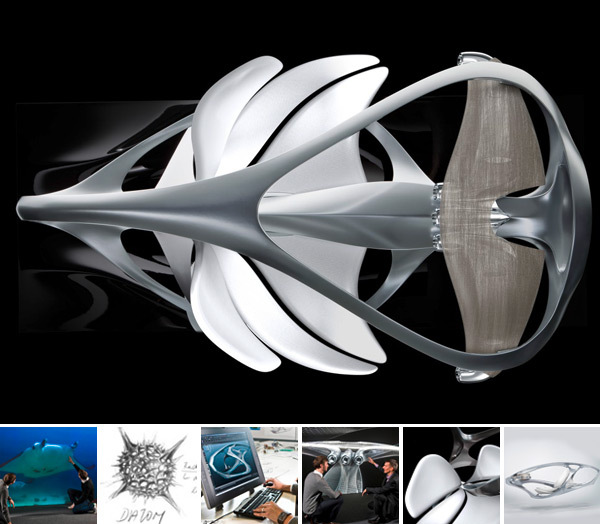 The process and creative imagery that is produced along the path to great products are often quite a work of art… It’s so inspiring to see Mercedes-Benz embracing the process by formalizing sculptures in their process of exploration and discovery. There’s something almost magical when seeing the design process itself shared through these sculptural experiments, especially when they share the sketches and organic inspiration that leads them there. Works of art being displayed along side concept cars and current cars fill you with curiosity and open ended inspiration of what the future may hold. Mercedes Aesthetics No. 2 just debuted at Detroit Auto Show. I love this quote from Mercedes Head of Design, Gorden Wagener, “Inspiration is the pre-condition for the calm, coherent yet passionately emotional design of our cars. In the interior sculpture Aesthetics No. 2 we have allowed creative fantasy to develop freely without constraints.” Regarding sculpture details, “On a scale of 1.5 to 1 the sculpture measures 18.3 x 6 x 8.5 feet. The finely wrought frame painted in alubeam Liquid Metal is light and strong; the white seating landscapes look like ivory.” Take a look at the inspiration behind and the design process that went into it… as well as the very cool final sculpture! Walking the show floor with Acquire Mag ~ he started describing how there’s this square thing over at Sony and it has shapes show up on it, and its on a bunch of slate… and of course i’m making fun of his vagueness as we wander towards it. Until we get there. Then there’s that moment of… oh. I see. 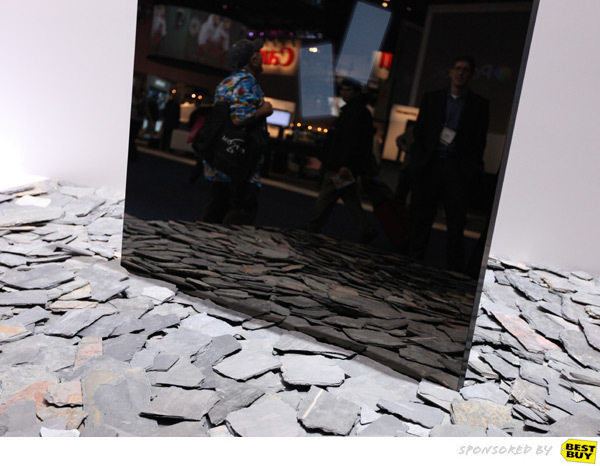 Square mirrored thing… on a bunch of slate shards… and, oh, wait! Shapes. It’s a screen. Oh, it stopped… basically, only to realize his descriptions were pretty good, considering! Honestly, this monolithic mirrored screen object was begging to intrigue curiosity and frustration from all who stood there confused and mesmerized. I was half expecting someone to throw a piece of the slate into it, or knock it over. Instead, everyone just stood and stared and circled. CES was a lot more relaxed this year when Friday night i hid out with Oakley’s 3D Optics Team and Macallan in a suite party and so many amazing friends popped by too… also the perfect way to get a relaxed, fun view of their new 3D glasses while sipping some delicious Macallan 25 (omg, so good) and also play with their ice balls… and the vegas views from up in the Aria were a gorgeous sparkling backdrop! And in between, i couldn’t help taking a bunch of silly pictures you’ll have to peek at on the next page! Oh! And i learned a lot about the 3D glasses world too… i’ll admit at first i couldn’t understand why i needed some if i didn’t have a 3D tv, but imaging going to someone’s house who does have one (and not enough glasses for everyone) or bringing your own that are more comfortable, better optics (and definitely look better) than the ones in theaters? Also, who knows where those others have been??? Whether i’m ready to have a pair handy in my purse at all times remains to be seen… and imagine a sports bar looking like this? But i’m definitely warming up to the idea of having my own for when those 3D situations do pop up! Anyhow, back to the pics! 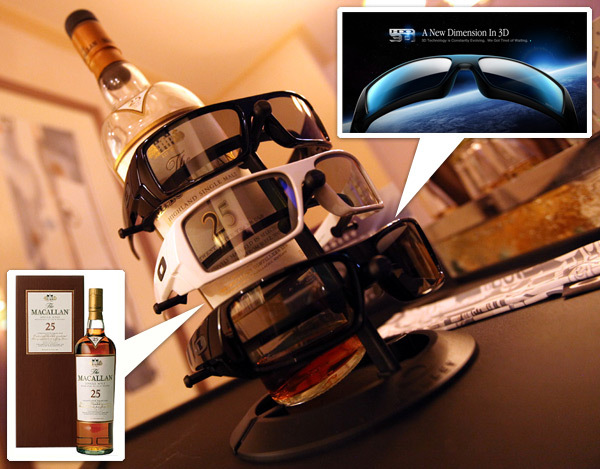 See more pics of the view, the glasses, the Macallan, and more on the next page! Luceplan HOPE light by Francisco Gomez Paz - i fell madly in love with the Hope light in Milan last year. And what better icon to celebrate 5 years of NOTCOT (embarking on our 6th this year!) and an end to 2010 with? I didn’t expect it to be fully built upon arrival, but i hadn’t given much thought to HOW the lamp is assembled either. The process and packaging is amazing. SO well thought out. Down to the white gloves with grippy bits so you don’t scratch/dirty the lenses… well protected lenses you can clip together only one way, and bend ever so gently. The way it mounts to the ceiling fixture, with another anchor to distribute the weight. 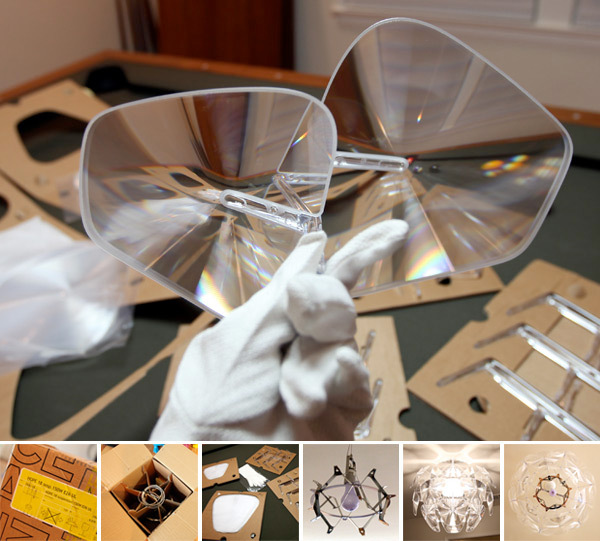 The way you can adjust the height easily even after installing… They even include special clothes to clean the lenses with… So thoughtful, love the process as much as the light! Anyhow, i could gush on, but it makes far more sense in pictures. And now, my living room is filled with Hope, and i can’t stop grinning every time i get lost staring at/into it. See it all on the next page! Freshly back from vegas, and already lusting after where to head next! Where will your travels take you this year? Get inspired with NotVentures. 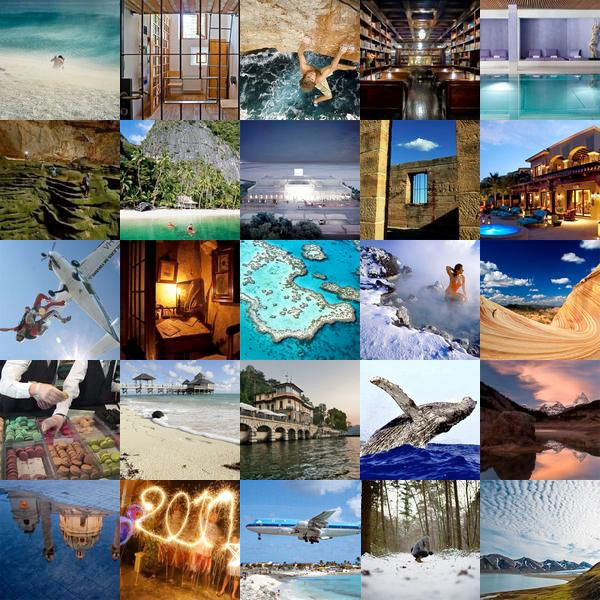 Click the pics to find out more, or share your inspiring destinations of choice too!